C.H. (Punch) Dickins once boasted to Maclean's Magazine, "put your pencil on any point on the map of Canada and we'll get you there — if you can afford it." The year was 1929. On April 11 — 90 years ago — he had just become the first to land in the Yellowknife area. He was bringing in reps from the mining company that would eventually start Con Gold Mine. Ninety years later, he's on a stamp. 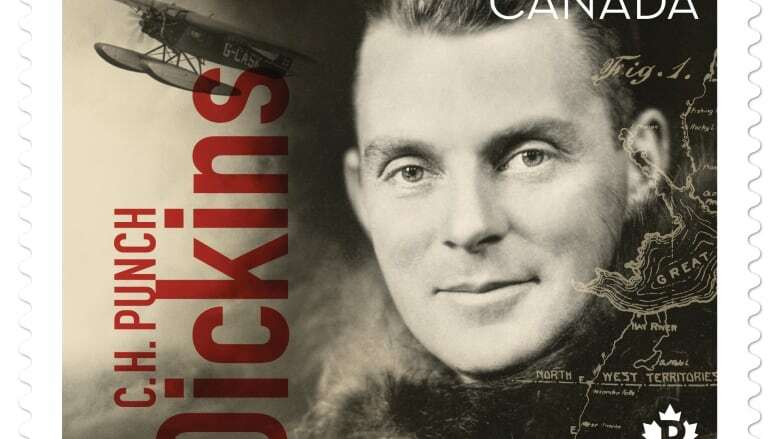 Dickins is one of five pilots to be celebrated by Canada Post in its newest stamp issue, Canadians in Flight. He's widely lauded for logging 1.6 million kilometres in the skies across Canada — many of them in North. Perhaps most famously, he embarked on a 6,000-kilometre reconnaissance flight in 1928 from Baker Lake to Fort Smith, over an immense swath of unmapped Canadian tundra. Western Canada Aviation, Dickins's employer, had been contracted to survey the area for prospective mining sites. He flew a 1928 Fokker Super Universal airplane, which could travel at about 90 kilometres per hour. He made the journey in about 37 hours flying time. Dickins recalled the adventure in a 1989 video documentary produced by the Northwest Territories government, By the Seat of Their Pants. "We had been flying over a piece of the map that was marked 'unexplored,'" he said. "I jokingly said [to my passengers] 'Now you fellows keep looking out the window and when you see any of those letters down there, you tell me, and I will know where we are." About 65 kilometres outside Fort Smith, the engine failed, leading to arguably one of the most famous stories in the Dickins lore. He landed on the Slave River and started paddling his plane to shore. Soon after, Dickins said he could hear the "chuff chuff chuff" of a steamboat coming towards them on the river. "He pushed his barge up against the bank about 20 yards away and said, 'Are you fellows in trouble?'" said Dickins. "I said, 'Well, not exactly, but do you have any airplane gasoline on that barge. And he said, 'Yes, I've got 10 barrels for some fellow named Dickins who thinks he's going to fly in here next summer." Dickins was awarded the McKee Trophy — the oldest aviation award in Canada — for this flight. The next year, Dickins's employer was told to fly up the Mackenzie River to provide the first mail deliveries in the area and promote commercial air travel. It was this mission that made him the first pilot to fly the entire length of the Mackenzie River. When he reached Aklavik that summer, he gave some of the interested Dene in the area the chance to fly in his plane. "They shrieked and yelled and were happy as clams," said Dickins. Dickins's stamp appears alongside two other pilots and three planes: First World War ace William George Barker, aeronautical engineer Elizabeth MacGill, the ultralight Lazair airplane and the Avro Canada CF-105 Arrow supersonic interceptor airplane. "[Dickins] is on there with some pretty big company," said Jim Phillips, director of stamps for Canada Post. "He's just a fascinating character."